Business Traveller has grown from the original UK edition first published in 1976 to 10 international editions in 2012. Business Traveller is a consumer publication, aimed at entertaining business travellers, saving them money and making their travelling life easier. 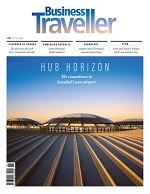 Each edition is packed with editorial on the latest news from airlines, airports, hotels and car rental. We review travel products, including the latest gadgets, technology and accessories designed to make the traveller's life easier and more efficient. We look at destinations - where to stay, what to eat, what to see, and how to behave, all delivered by our own writers and journalists around the world. In addition, the many loyalty programmes are examined, deals and promotions are collected and feature stories cover a wide range of issues such as health, security, technology, golf, automotive, financial and buying property.